You are here: Home / Striding vs Legion, Which one is more beneficial? Hello Everyone since this is my first article I'm going to give you a little bit of background on who I am before we start. Ill Start off with My name is Tye Janesek but I am more commonly known as Scotch. I've been playing this game since BT01 first came to the US. I've competed on the national level and have Judged multiple events from regionals to the ARG Vanguard events. So its safe to say in the Vanguard world I've been around the block a few times. However I don't only play Cardfight! Vanguard. I've played Yugioh and Magic for years so I bring a unique outlook to our community and hopefully you will find entertainment as well as knowledge in each of my articles. Now Without Further interruption. I present to you my first Article. 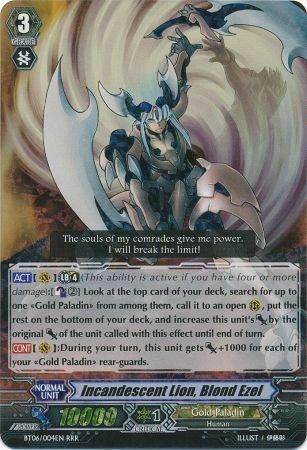 Over the years in Cardfight Vanguard we have seen many different mechanics come into play. From back in the simple days where everything was just based off of counter blasting your damage which progressed to the rarely used Cross Rides. The next step of evolution for Vanguard mechanics was the Limit Break. This introduced a whole new style of play because it gave your damage a meaning. No longer would you have to shield every single attack due to fear of losing out to a double Critical Trigger. 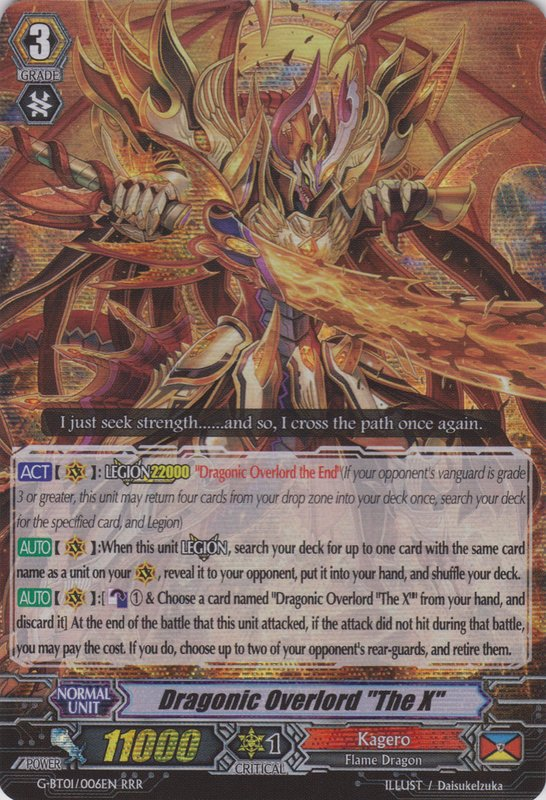 Mainly because it was now beneficial to allow a fourth damage in order to get off an effect such as Incandescent Lion Blond Ezel. This card required you to have a 4 damage in order to activate his effect. However, the Limit Break ability for a time was overshadowed by the much more risky Ultimate Break which required 5 Damage. The main issue with this is that it drew you very close to the edge of losing since the game only requires 6 damage to lose the game. After Ultimate break the next evolution of the game came in the form of Break Rides. The Break Rides would allow you to gain and affect by riding a grade 3 unit on top of it. An example of the power of a Break Ride is Prism-Image Vert. 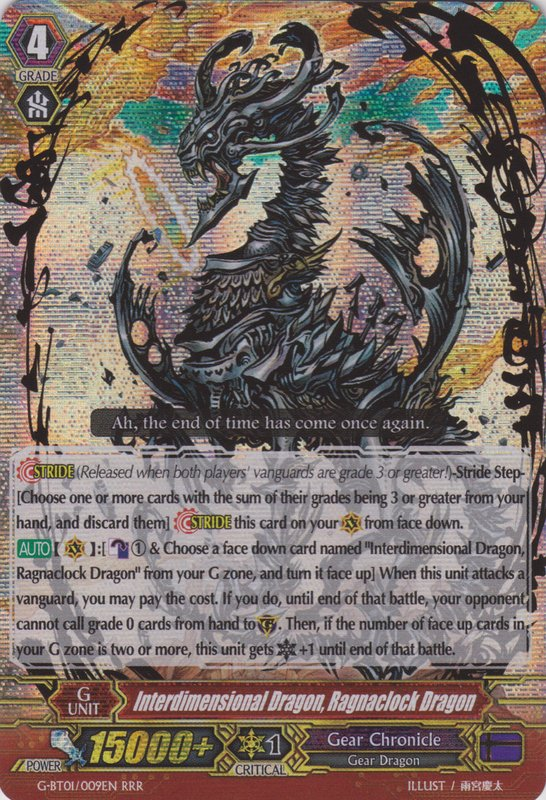 She was the first Break Ride introduced to the English Meta and it easily rose to the top of the meta against a deck that has long been considered tier one Dragonic Overlord The End, or better known as DOTE. Eventually with the release of more Break Rides came the Cross Break Rides, which would allow added effects if you were Break Riding a certain card or a card with a key phrase in its name such as Overlord. However, all of these soon became insignificant with the reason of one of the most powerful and boarder line game breaking mechanics the game has seen, The Legion. Legions introduced a very efficient way to recycle 4 cards into your deck in order to find the Vanguards “mate”. Legioning has a single drawback that in the beginning seemed almost like a fatal flaw. In order to legion both players must have a Vanguard that is a grade 3 or higher. If you meet this condition you are able to recycle 4 cards from your drop zone into your deck and search for your legion mate which you would in turn ride alongside your Vanguard. Now the legion card would specifically name which card you were able to seek, an example would be Dragonic Overlord “The X” or as it is more recognizably known as The Cross. Now he states that his legion mate is Dragonic Overlord the End. Between the two of them you are able to re-stand your vanguard if you are able to meet the requirements which in this case would be Counter Blast (1) and choose a card named "Dragonic Overlord "The X"" from your hand, and to discard it. At the end of the battle, if the attack did not hit during that battle, you will pay the cost. If you do, choose up to two of your opponent's rear-guards, and retire them. Now the thing that makes the DOTE deck so powerful in my opinion, is its uncanny ability to not only re-stand itself but also continuously recycle the legion units and mates. All it takes is another copy of the legion and a card on the field that can soul blast. This creates an almost infinite loop that will allow you to constantly recycle triggers and any valuable cards that are currently in your drop zone back into the deck so they can be reused. For a time this hurt the game because any game that has an infinite loop is damaging and corrosive to the gameplay. In my opinion, the legions needed a counterbalance to it something that would be able to slow it down and balance the game out so that anyone would have an opportunity to win versus only someone who had the most expensive Meta decks winning. Recently that counterbalance came in the form of Generation Stride. To start with this mechanic added a new phase to the game, the Stride phase. This phase follows the ride phase in the chain of events. Stride Units have a similar riding method to legion where it required both players to have a Vanguard that was grade 3. In order to stride you must pitch to the drop zone cards that have a grade that is equal to or greater than grade 3. Once this is done you ride or “stride” a grade 4 unit over your Vanguard. Generation Stride not only added a new phase to the game but it also introduced something that has been in other games for a long time. It introduced an 8 card extra deck in the form of the G-Zone, and at the end of the turn the unit that you strode returns to the G-Zone face up indicating that it has been used. With that 3 more mechanics came into play G-assist, Generation Break, and Break Stride. The G-assist mechanic gives a player who has stride units the ability to get out of what is commonly known as Grade lock. This term refers to the moment in a game where you can’t get to the next grade level due to not having the resources. The way this mechanic works is you reveal your hand to your opponent, then you search the top five cards from your deck for a unit with the grade that you need. If you locate one then you ride that card. The cost for this is you must also remove from play 2 cards from your hand as well as 2 cards from your G-Zone. Honestly, it is a balanced way of getting out of Grade lock but it will put you down 2 cards. In the long run you may very well be able to pull a win out of it. The second mechanic introduced with Generation Stride was Generation Break, this works similar to the way Limit Break works. Except instead of damage it relies on un-flipped cards in your G-zone, which earlier in the article I described how cards are un-flipped. The final mechanic that was introduced with Stride was the Break Stride. Break Stride is a modified version of the Break Ride, which is similar to Generation Break that is a modified version of Limit Break. Now I am 100% sure right now you are sitting there reading this and thinking to yourself, “Scotch how is any of this relating to what is beneficial to me as a player?” Simple in any card game you need to know the basics before you can make an educated decision on what you want to play. Our game is fairly simple in the scope of other card games and what it all boils down to is your play style. Legion introduced the ability to recycle your drop zone into your deck for basically free. Whereas Generation Stride introduced several other mechanics and improved on old ones at the same time so here comes the real question. What Do I Play? Now both units have their positives and to be honest both have a similar weakness. Decks like Gear Chronicle tend to rely heavily on their Stride units. Without them the bulk of their decks become vanilla or has no effect at all. However, with their Stride units and with Generation Break the deck is very powerful. A prime example of this is Interdimensional Dragon Ragnaclock Dragon. His effect has not only added to his attack but also puts a guard restriction on your opponent. Well folks that’s all I have for you today. Thank you for reading and as always keep on Keepin On and always remember to never stride on a Stunned Vanguard.